If this should be put in the "warp & Woof" forum, my apologies. Please feel free to move it there. I would like to commission a three piece suit in a black/white or grey/white herringbone. I would like the herringbone to be fairly visible, achieving a sort of "salt and pepper" effect, perhaps. I have looked with the help of my tailor (Messrs. Brian Lewis and Brian Jones, at Meyer & Mortimer, who were both very patient and helpful) and such a cloth does not seem to exist in worsted. It will have to be tweed, unless one of you can point me to a source I have missed, but I want to stay away from brown or green because I do not want anything too "rural". Sure, there are worsted herringbones, but they are of a discreet grey on grey variety. I am looking for something bolder. I would like a hard wearing cloth, with a dry hand, no lighter than 13 oz. Can you think of other choices? Anything you would recommend? Of the two I have found, and any others, which one would be better, in terms of hand, longevity, appearance when made up, etc..? I think Holland and Sherry perennial has a plain grey 400g herringbone? Edit: PS, nothing wrong with a houndstooth suit. You can get worsted b/w houndstooths fairly easily. Edited by rs232, 08 October 2010 - 08:09 AM. Thank you. I shall look at H & S Perennial. Would this be akin to what you're looking for ? It's black & white micro herringbone (3mm), in a nice 310/330g super 100s worsted by Harrisons (Burley).It's quite wooly for a worsted, similar to Dugdale's English classics (but a tad lighter, though still in a good weight). This is the lighter herringbone I have, this book has a good selection of darker ones (8 shades from white/black to pure black, with the black & greys between). If your tailor does not work with them, I can provide you a cut length (in Paris, or send it to them in London). You can visit me in Paris to check the sample, coffee included. 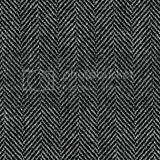 If you're looking for bold herringbone, in the 8mm-1cm wide, I think you need to choose a woolen cloth. I have some nice ones in shetland and saxony, but those a "fuzzier" than worsted. Maybe this would be nice, it's a saxony with a milled finished, quite smooth, in 390g. Herringbone is 8mm wide (each row, which means 16mm for an "up and down" ^). Mill is Marling & Evans, same as Harrisons I can provide it to you. And there is also a darker shade. I certainly second black and white hound's-tooth for a suit. The Marling & Evans at 12/13 oz. sound more promising and looks very good. NJS: I have not decided yet and am keeping an open mind. Cloth weight and "hardness" and a dry hand are primary considerations. I tend to stay away from flannely cloths as they wear faster and keep me too warm. I shall be seeing Paul Munday (Meyer & Mortimer/Jones Chalk & Dawson) in Paris in mid-late October. I shall review what swatch books he brings and do a preliminary search. I have to go to London at some point (Late October-Early November during our sons' school holidays, and/or again in December) and will look at the whole range at the shop. It might also be possible to visit W. Bill for other options. Marling & Evans is a woolen, not a worsted. So it's not that dry. But not a flanel either. BTW, do you have some references of good books/mills for worsted in the 13oz and above, other than Dugdale's English classics ? It's difficult today to find anything above 10oz. (not a real problem, though, it's hard to sell anything above 10oz anyway, customers usually ask for 8-9 oz, you are an unusual one !). I have a suit being made in a 13 oz. H. Lesser (ref. : 29712). I know it is a new book, because when I ordered earlier this year (July), it was marked as available only in October. It is now out, since I have had one fitting already. I would also look at Smith Woollens. I have a couple of suits in their 12/13 oz. range. Very nice cloths as well. There is also P & B (Pedersen & Becker; they belong to another, larger, house). I remember that Sator reviewed their range in the Warp & Woof forum. A search should unearth the thread. You will find the fabric in Huddersfield "English Classics" At least it is in my bunches. Nishijin has already mentioned it I just see. Worth looking online. Réf 9469 is black and light grey. There is no black and white in the book (maybe that's why I did not mention it), but the 9469 is very near salt & pepper effet. Herringbone is 6/12mm, so quire visible. 14oz worsted, to it might be it ! Thank you all. I had seen 9469, but it looks like pure grey to me, not the grey/white or black/white mix I am looking for (in as much as I really know what I am looking for.... ). Moreover,as previoulsy explained, a search conducted at my tailors' had found no worsted in the colour/patterns I am looking for. I think nothing, and certainly not an internet photograph, replaces seeing and handling a sample. H. Lesser's website (http://http://www.hlesser.co.uk/) shows a nice grey/white herringbone, but is it a worsted? Is it available? Bold white & black herringbones are also found more frequently in overcoatings. So I hope for you the one on H Lesser's website is a suiting or a jacketing, and not an overcoating. I agree nothing replace hand and feel. Pictures were just to give you a rough idea, so you know it it may be it, or if it's not at all. I don't think they make anything worsted above 360g on a regular basis, though I got an odd length of ~420g semi-milled grey from him eariler this year. Thank you rs232, I'll ask. I understood from Richard Harrison that the books he sent me were all they have as stock supported. Of course, that does not mean they do not do anything else (quite the contrary), and that sometimes they might have roll ends in this weigth range. Ultimately even more important are the iron, shears and needle. It's only once you start attacking into the cloth that it's real character starts to reveal itself. Perish the thought! I am just a bespeaker, not a pro ! It's a 570g worsted, in super 100s. Presumably an overcoating, but it's quite dry, so it might give good results as a suit. It's certainly "smoothier" than a tweed or any wollen. Same as usual, sample visible in Paris, and can provide you a cut length if you need (but I'm sure your tailor knows Taylor & Lodge).